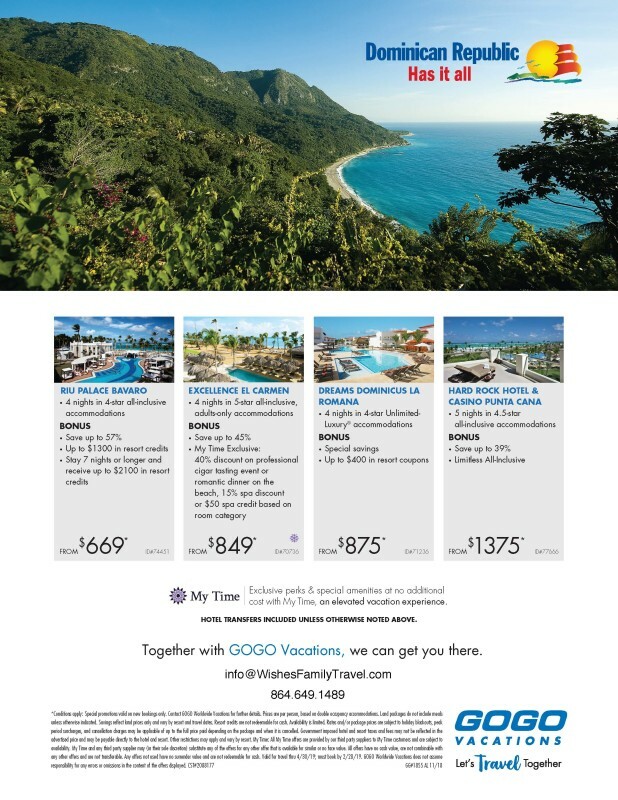 Book By: 2.28.19 Dominican Republic "Last minute deals!" *Conditions apply: Special promotions valid on new bookings only. Contact GOGO Worldwide Vacations for further details. Prices are per person, based on double occupancy accommodations. Land packages do not include meals unless otherwise indicated. Savings reflect land prices only and vary by resort and travel dates. Resort credits are not redeemable for cash. Availability is limited. Rates and/or package prices are subject to holiday blackouts, peak period surcharges, and cancellation charges may be applicable of up to the full price paid depending on the package and when it is cancelled. Government imposed hotel and resort taxes and fees may not be reflected in the advertised price and may be payable directly to the hotel and resort. Other restrictions may apply and vary by resort. My Time: All My Time offers are provided by our third party suppliers to My Time customers and are subject to availability. My Time and any third party supplier may (in their sole discretion) substitute any of the offers for any other offer that is available for similar or no face value. All offers have no cash value, are not combinable with any other offers and are not transferable. Any offers not used have no surrender value and are not redeemable for cash. Valid for travel thru 4/30/19; must book by 2/28/19.